As the clock ticked down to Oct. 12th, the day of our Annual NC Big Sweep Event, the government shutdown dragged on. Finally, the Army Corps of Engineers had to close Poe's Ridge Boat Ramps off Jordan Dam Rd. where we had planned to have boating and kayaking volunteers launch. With just a few days to go, we had to notify boaters and kayakers that the launch site would be New Hope Overlook, doubling the distance to reach the cleanup sites on the east side of the lake near the dam and on the tip of Wilderness Island. It meant that boaters would have to use more gas and kayakers would need to paddle 1 hour rather than 30 minutes to Wilderness Island. The shutdown had other impacts. The Corps had to keep a land gate closed near the spillway, forcing our land-based volunteers to walk an extra one-half mile to the shoreline. 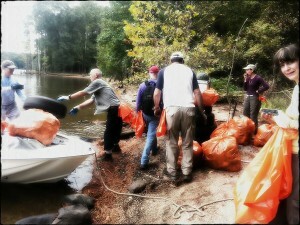 Moreover, the Corps’ pontoon boat and operator were unavailable to haul trash from the shoreline to the dumpster. Yet volunteers were undeterred by the change in plans. About 125 volunteers showed up. Boaters not only hauled all the trash but they ferried the kayaking volunteers to and from Wilderness Island so they would not have to paddle for an hour to get there. Walking volunteers did not complain about the extra distance to shoreline. One volunteer commented online after the event that he enjoyed getting the extra exercise. Volunteers collected over 250 bags of trash and 24 tires. Over 2 miles of shoreline were cleaned. Seven of the nine Trash Treasure Hunt items were found and redeemed for great prizes provided by REI, Rainbow Cycles, Subway and CJL. The delicious baked penne donated by Amante Pizza of Cary and the prizes are still inadequate thanks for volunteer dedication. On Sunday, October 13th, the Jordan Lake Environment Education, a member of Clean Jordan Lake's Adopt-A-Shoreline program, provided their contribution to NC Big Sweep. The 45 volunteers comprised Boy Scouts and supervising adults. They removed about 50 bags of trash from the NC Wildlife Commissions's Bell's Church Fishing Access, the shoreline across from Bell's Church, around the bridge on Rt. 751 at Northeast Creek and at the Crosswinds campground. The trash bag count is now close to 8,000 (that's about 80 tons!) and the tire count has surpassed 3,000. Trash continues to pile up on the shoreline after each heavy rainfall. But as long as we can get volunteers to keep coming to help, trash will not accumulate as it did before the arrival of Clean Jordan Lake. Our long term goal is to prevent trash at its source by asking for the help of counties upstream of the lake in educating the public and enforcing anti-litter and illegal dumping laws.